Mary responded, "I am the Lord's servant. May everything you have said about me come true." And then the angel left her. The greatest in the Kingdom of God is a servant (Matthew 23:11-12). So we should not be surprised when God's Son and our Savior explained his role as a servant (Mark 10:45), should we? Jesus conviction about the greatest being a servant wasn't just talk. 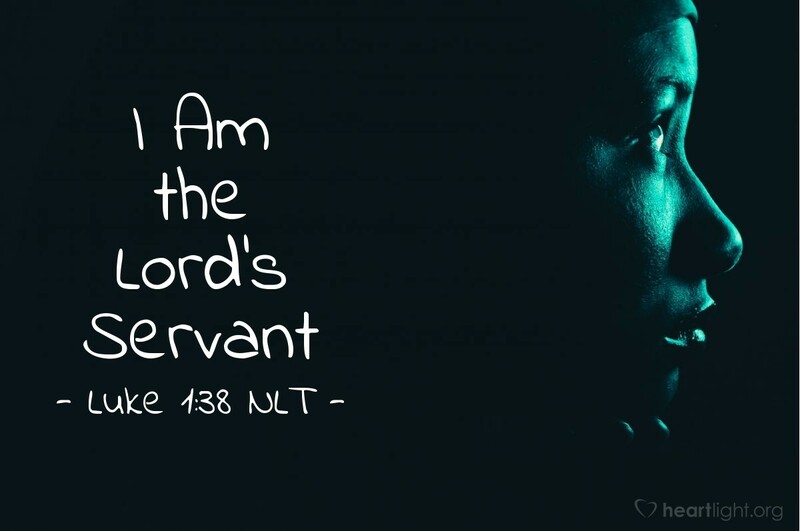 He certainly demonstrated it, and his mother was a great example of this truth when she offered herself to God by saying, "I am the Lord's servant." Have you said it? Have you offered yourself as a servant to God Almighty? Mary did! Her son, who was also God's Son, did! O LORD God, Creator of the universe and the Father who created me in the womb of my mother, I offer myself to you as your servant. I am not sure if you will fill my earthly life with wonder like Mary's or if it will be filled with sorrow, also like Mary's. But I do, dear LORD, want to serve you in this world, knowing that I will sit at your side as your dear child in the world to come. In Jesus' name. Amen.